Footloose, the Musical has received rave reviews, and now you have the opportunity to see it for only $10! Limit of four tickets per person. This offer is not valid on previous purchases. Purchase your $10 tickets through the Omaha Community Playhouse Box Office in person or by phone only. Just mention this write up. Tickets are subject to availability. So kick off your Sunday shoes and get to Footloose, the Musical! Meetings will be held at the Playhouse the last Tuesday of each month. This club is FREE and open to the public. For more information, contact Amy Lane at alane@omahaplayhouse.com or (402) 553-4890, ext. 164. Fashion design has certainly made a name for itself within the past few years. Shows like Project Runway have drawn attention to not only big name designers and up-and-coming designers, but also the art of designing and creating clothes. Locally, Omaha Fashion Week, which just completed it's third year, has highlighted Omaha's fashion scene and the craft masters within it. But we've been creating designs far longer than Tim Gunn's signature phrase "Make it work" appeared on our television sets. Our costume department consists of five full-time employees, multiple part-time employees and an array of volunteers. 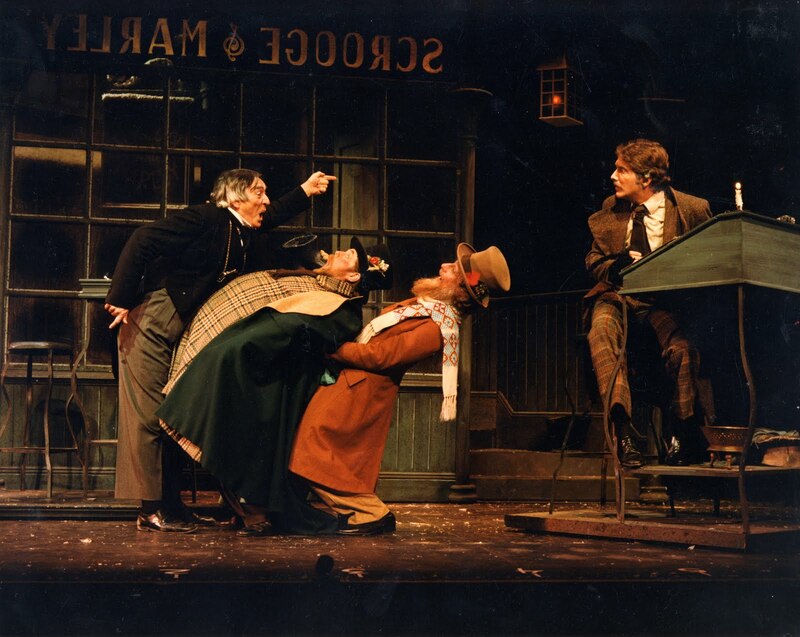 This group not only creates costumes for all the actors in our regular season productions, but they also create the costumes for A Christmas Carol and the touring groups. STITCHER: A stitcher requires a basic knowledge of sewing skills. Depending on the skill of the volunteer, the jobs range from buttons, hems and trim to the actual construction of a garment. CRAFTS PERSON: The crafts person works with accessories for costumes: jewelry; shoes; hats; feathers; buttons; lace; ribbon; etc. SHOP ASSISTANT: The shop assistant helps in setting up dressing rooms, returning costumes to stock and doing laundry for current shows. DRESSER: A dresser assists performers with costume and wig changes during the performance. It's true that you won't see Heidi Klum on our stage, but you'll see a variety of world-class performances, and you could be a part of it all. To volunteer in the costume shop in the nation's largest community theatre, contact the Costume Shop Supervisor at (402) 553-4890, ext. 150. You could help us "make it work". Sights and sounds from Footloose, the Musical at the Omaha Community Playhouse. Thanks to Dave Wingert, KGOR for the interview with Carl Beck. All photos were taken by Robertson Photography. Here is our Cox Commercial for Footloose, the Muscial! Footloose, the Musical is opening this weekend, and there is an array of affordable options to see this fan favorite. If you're a high school or full-time college student, you qualify to receive lower prices for every show. But $7? Get out! On opening weekend of a regular season production, students can see the play for only $7! Students should call the box office at 553-0800 or visit the box office in person to purchase a Lucky 7 ticket. Students must show their student ID when picking up the ticket at the Will Call window. If you're not a college student, but still enjoy reasonably priced shows, $7 Sunday Nights could be just the ticket. $7 tickets are available on Sunday nights during the opening weekend of each show in the Howard in Rhonda Hawks Mainstage theatre (does not include A Christmas Carol.) Tickets are available in person at the box office window starting at 4 p.m. on the day of the show. Cash and check are the accepted forms of payment. But you gotta be fast...these seats sell quickly! So grab a $7 ticket and enjoy Footloose, The Musical this weekend! Question is: Are you ready for us? Are we ever ready for others to see our work? To have our efforts critiqued by the newspapers and the people attending the nightly performances? Is there ever a way to mentally prepare yourself for that? The pieces are coming together, slowly at first, but progressively it needs fewer takes to get it all right. More than once it gets done right the first time, and isn't that a thrill? Set pieces slide and fly into place guided by the sure and steady hand of the crew members, clad solely in black, who move with such purpose and direction that it is to be envied. Lights and props get added with almost each passing moment. Occasionally it phases the cast, but bright flashing lights tend to do that the first time through. The building sense of excitement sends the crowd of kids into titters. They can't wait to try out the new addition to the opening number; it's simply going to be a blast. Or maybe it isn't the lights, or the colors, or the newness of a prop, or set pieces dropping from above. Maybe it's the growing sense of wonder. The feeling that comes with watching the otherwise unseen technical aspects meld with all the movement and characters on stage. It gets more and more real by the second. It's a great blessing for a cast to work with such dedicated and knowledgable technicians. Greg Scheer leads the crew and Mary Dew has dropped out of sight to call the cues from her lighted stand, hidden off stage right. Both stand guard over the scene changes like strict but benevolent masters, whispering quiet reminders into radios. However, they lead a crew that walks and moves with assuring confidence, experience and with a good sense of humor. Tiny malfunctions in the moving set pieces get a quick and permanent fix after only a moment's study, and it's smooth sailing after. It's a giant puzzle, figuring out which pieces go where and when and how best to manage the limited space behind the curtains. The newest addition to the run of the show is the uplifting presence of the orchestra, adding energy and a more complete tone to the music. The rock beats get more defined and bring the dances and songs to life, moving the dancers through the numbers. Everyone polishes. The company runs the scenes, and runs, then run again, just to make sure everything is getting better and better. Every day as we exhaust ourselves going through number after number, preparing for opening night this Friday. It's close. We're getting ready for everyone that walks into the auditorium, be it critic, family or complete stranger. It doesn't matter. The doors open at 7 p.m. September 17, the show at 7:30 p.m. Guest post by a Footloose, the Musical cast member. The familiar wooden dance floor, the same blue and red walls, the same chandelier hanging overhead in a corner from as long ago as I can remember. Colored tape lines the floor, different shades to denote different set pieces and placement; it's been torn and turned up by feet moving and spinning during the furious dancing sessions, gaps have been made from pieces of pink or white tape leaving on the bottom of a shoe or sock. The piano has taken its place in the opposite corner of the chandelier, on the ground of course, with Jim Boggess tickling the ivories in his usual magnificent style. As he leads the cast of wizened adults and wise-cracking youths through a warm-up and run through of the night's big number you can feel, if you close your eyes and imagine, that the sounds take you as high as that chandelier and higher still. It is music of youth and freedom, a celebration of life and never being someone you aren't, never giving into the pressure that life and close-minded thinking can enforce. Carl Beck watches from his seat beside Mary Dew, the Mona Lisa of directors (for no matter where you stand and return his gaze, his eyes peer into yours and everyone else's) and the no-nonsense stage manager with a brilliant smile. David Catherall sits slightly off from them, his gaze fixed on the cast, thinking of the dance numbers to be run in only a few moments. He seeks perfection from the dancers in his unique dances that have pushed the cast to their limit, only to be coached beyond. Their movements have been sharpened and changes made, but it all works. The warm-up finishes, and after a few words of encouragement and thanks from Boggess, the cast begins to titter with energy, ready to rock 'n roll. The kids don knee pads and dance shoes to run through the finale - a spirited and fast paced dance that culminates in- well, let's not spoil the surprise. Theresa Fuchs practices a double spin, JR Gould marks through the whole number quickly, others count time and say their moves aloud. Paul Hanson, 'Ren' to the audience, stands poised and ready in the middle of the room, looking confident and at ease. Josh Peyton heaves a big breath and readies himself. What drives us to perform? In the end, does it matter? Theatre is an experience like no other, a place where we can lose ourselves in stories that resolve in only hours, where kids grow and close-minded people learn to open themselves to the new and unfamiliar. It's an opportunity to hope and dream and challenge preconceived notions. It's a chance to have a lot of fun. In the Playhouse's production of Footloose, The Musical which runs September 17-October 17, you get a chance to do all of that, and more. We see it in the resurgence of off-the-shoulder shirts, leggings and massive amounts of chunky jewelry. We see it in the public obsession of 1980s music and the lasting presence and influence of culture icons from the era. We even see it in the results of last year’s voter poll at the Omaha Community Playhouse when patrons were asked to vote for the musicals they would most like to see and Footloose, The Musical came out on top. We just can’t get enough of the 80s! Neither can lead actor Paul Hanson…even though he wasn’t alive for the majority of the decade. When the movie Footloose came out in 1984, Paul, who is playing lead character Ren, wasn’t even born yet. That doesn’t mean he doesn’t know how to cut footloose, though. With radio stations dedicated to the 80s and the likelihood of not hearing the Kenny Loggins song Footloose at a wedding reception being slim to none, this young actor is a super fan of the era and the music. See this young star and the rest of the talented cast shine in Footloose, The Musical, Sept. 17–Oct. 17 in the Howard and Rhonda Hawks Mainstage Theatre. To order tickets, visit the Box Office, call (402) 553-0800 or visit www.omahaplayhouse.org. Join the Omaha Community Playhouse’s very own “book club”. This play reading club is an opportunity for theatre lovers to meet regularly to read and discuss dramatic literature. Join us for the first meeting where we will decide as a group which plays we will read over the year. RSVP to Amy Lane at alane@omahaplayhouse.com or (402) 553-4890, ext. 164. Here's your chance to let your inner child loose. Or if you don't have an inner child to unleash, bring your kids or grand kids to the Children's Museum in September and take advantage of this month's Metro Arts Pass deal. Omaha Community Playhouse season subscribers can bring their membership cards to the Omaha Children's Museum in the month of September to receive $1 off admission. With our 86th season underway, I can't help but notice a trend in this season's productions. Many of the plays we are doing are not only for the stage; they are also movies, books and television series. So it got me thinking...which came first? I didn't know the answer to most of these. In fact, I didn't know some of the plays were also movies at all. Did you? Here's a run down of some of this season's shows and if the play was the original or was inspired by a different medium. I put the answers further down in the post so you can test your knowledge. Footloose, The Musical: Everyone knows Kevin Bacon for his iconic role as Ren in the movie Footloose, but did Ren dance into our hearts first on the big screen or on the stage? A Thousand Clowns: Murray and Nick captured audiences with their rendition of Yes Sir, That's My Baby, but where did they perform it first? In the play or the movie? The Odd Couple: Where did Felix and Oscar have their first lovers' quarrel? Was in the play, the film or the television series? Steel Magnolias: Ouiser! The film is loaded with a superstar cast including Julia Roberts, Sally Field and Dolly Parton, among others, but did were those superstars inspired by the stage production or vice versa? Tuesdays with Morrie: This touching story of Morrie and Mitch is tough to even think about without getting inspired and a little choked up, but who was weeping first? Book readers, movie goers or play patrons? Guys & Dolls: A classic no doubt, but did these guys and dolls make their debut in the play or the movie? Footloose, The Musical: The movie. The 1984 hit movie was adapted for the stage in 1998. A Thousand Clowns: The play. Herb Gardner wrote the play in 1962 and then adapted it for film in 1965. The Odd Couple: The play. Neil Simon's play hit Broadway in 1965, the movie followed in 1968 and the television series ran from 1970 to 1975. Steel Magnolias: The play. Surprised? I was. The 1989 film was based off the 1987 off-Broadway production by Robert Harling. Tuesdays with Morrie: The book. This Mitch Albom bestseller was published in 1997, followed by the 1999 movie, followed by the 2002 stage production. Guys & Dolls: The play. This Tony Award-winning musical debuted in 1950 on stage and 1955 on the big screen. Now that you know which came first, be sure not to miss any of these hits at the Playhouse this season!